Bennie moved to Richmond for law school, but stayed for the people. Coming from the rural farming town of Buffalo Junction, Virginia, Bennie quickly fell in love with Richmond; the big city with a small town feel. Bennie actively embraces all the city has to offer. On any given weekend, you may find Bennie catching a show at the Altria, cheering on the Kickers at City Stadium, or floating down the James. Bennie is an avid fisherman and a diehard Spiders fan. At the University of Richmond, Bennie focused his coursework on advanced estate, business, and tax planning. 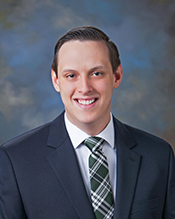 Earning distinction in both his studies and his community service as the 2015 recipient of the CALI Center Award for Excellence for the Future in Estate Planning and the Harry L. Carrico Center’s Pro Bono & Public Service Certificate. It is this passion for the practice that drove Bennie to join Carrell Blanton Ferris & Associates. Here, Bennie focuses his practice on Trusts and Estates. He works in both planning and administration because he believes sound planning simplifies administration, but the key to sound planning is a practical knowledge of the administration process. With this holistic view, Bennie works with his clients to help them see that there is more to estate planning than a simple set of documents. Without the proper alignment of your personal assets to your estate plan, the plan will likely encounter unnecessary expenses and complications. His professional goal is to match your wishes with the best plan to achieve them at the lowest administrative cost. Pro Bono Scholastici: Getting Out of the Building While Remaining in the Classroom, 19 Rich. J.L. & Pub. Int. 443 (2016).